The Rainforest Garden: Aechmea Cylindrata "Blue Cone"
My mystery bromeliads from "Tropical World" nursery have finally bloomed! I knew that they were in the ortgeisea alliance by looking at the leaves, but know I can finally say with certainty that these are a cultivar of aechmea cylindrata called blue cone. The flower clusters are denser than the species and have a typical matchstick color scheme of neon blue and pink. Though a couple sources online say to avoid full sun, I actually found it at the nursery doing quite well in a sunny spot. 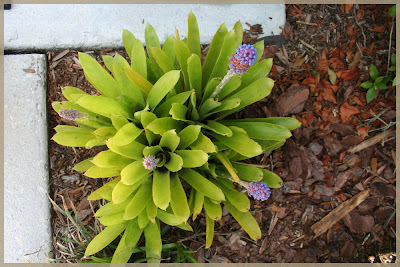 To keep the bright coloring and tight rosettes I planted it in a sunny spot near the front door, where it greets visitors with its electrifying inflorescences. Aechmea cylindrata is similar to aechmea gamosepela and is very cold hardy as far as bromeliads go. For those of you who lost some tropicals this winter, try using either of these two aechmeas as tough groundcovers or as epiphytes! Even after they bloom, the bracts stay in color for months, much like heliconias. Oh, these are gorgeous! Perfect next to the front door. Isn't it grand how long the blue cone stalks last??? How pretty those are, and I love plants with flowers that last forever. Great looking Brom! I have some of the Aechmea Gamosepala that I just divided. Nice! Well, I'd love to add this lovely creature to my garden...if only I knew where to find one. Hmmm.... It is beautiful. That is such a nice blue color. Very beautiful plants. You have sited them well. Hi this is my first time here, followed your comment at NellJean's. 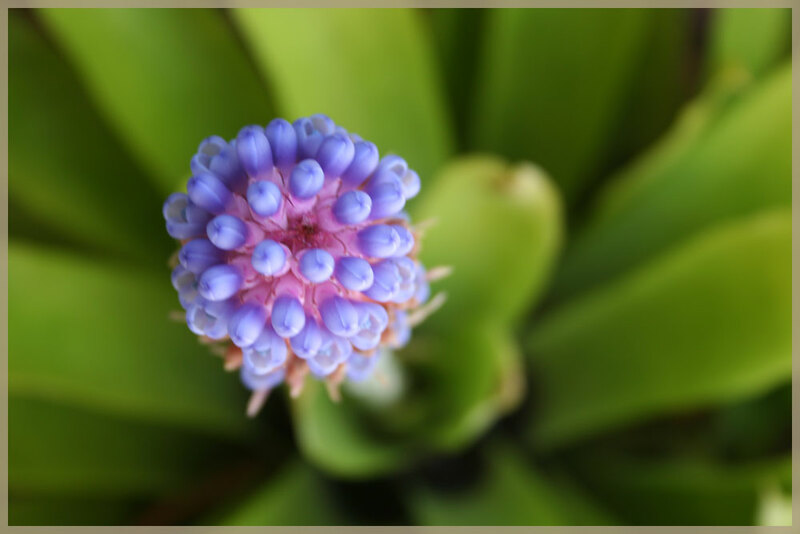 That blue flowered Bromeliad is beautiful. I had a lot of bromeliad posts also a few months ago. You reminded me of posting the dew-full leaves. thanks. I just got one of these at a plant raffle last week, and then an unidentified bromeliad of mine started blooming and it's the same thing! Now I have two of them! 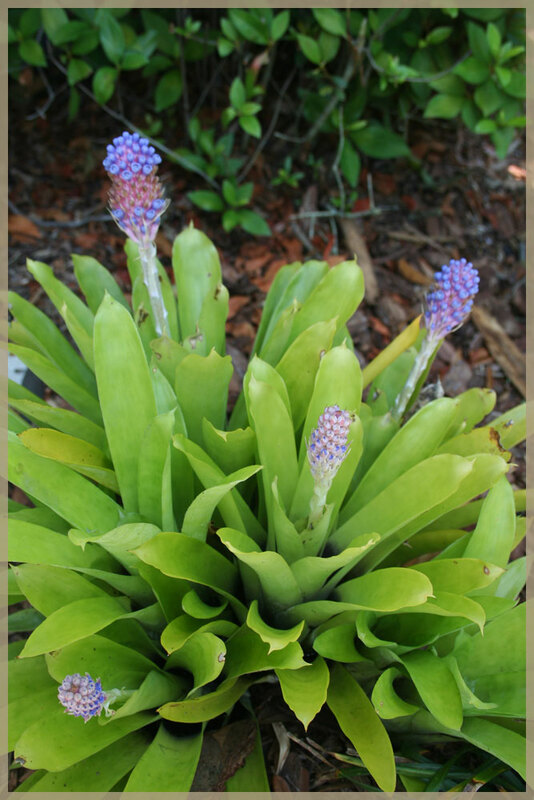 Even without the flowers, that bromeliad is simply beautiful. The blooms just added more beauty to it. Andrea: Nice to have you! I checked out your blog and now follow it... Lots of great posts there! Grower Jim: I'm so glad that you have one too! It seems to be pretty prolific so I hope to do a lot of propogating. Solitude: I agree! I love the glossy leaves and the overall form. Definitely one of my favorites now.